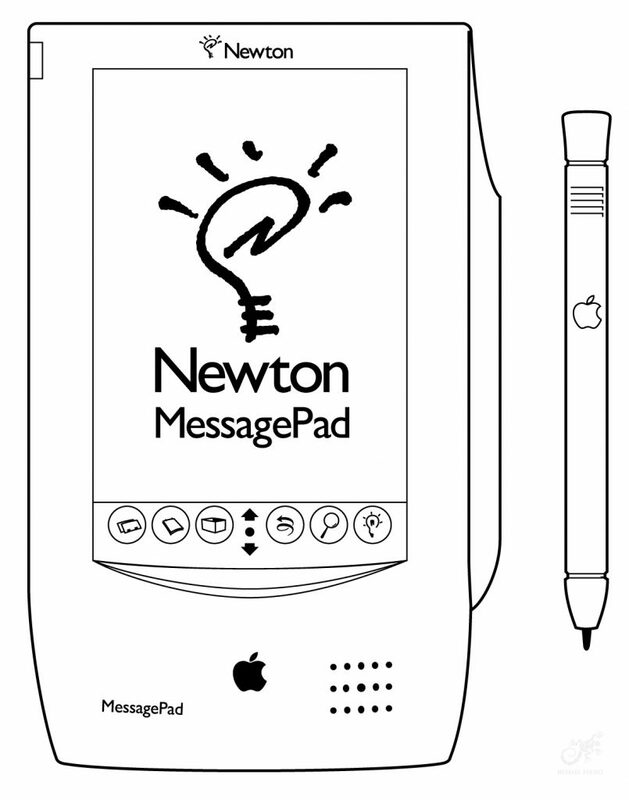 The Apple Newton MessagePad Original is the first in a family of communications assistants from Apple. By combining Newton Intelligence technology with sophisticated communications capabilities, the Newton MessagePads help you stay in touch with friends and colleagues, organize your life, and keep track of your ideas. 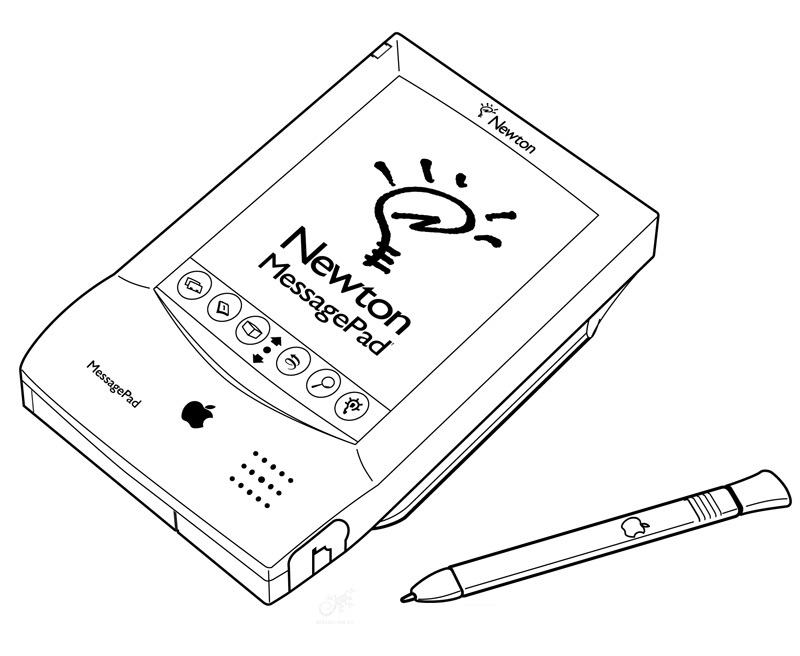 The Apple Newton MessagePad Original is the first in a family of communications assistants from Apple. By combining Newton Intelligence technology with sophisticated communications capabilities, the Newton MessagePads help you stay in touch with friends and colleagues, organize your life, and keep track of your ideas. You can take notes. Make a quick sketch. Format and print letters. Share and synchronize information with your personal computer. Send a fax. Receive pages and messages. Tap into on-line services or electronic mail. Even exchange business cards with a colleague via built-in infrared technology. And wherever you go, the powerful, under-one-pound personal digital assistant goes too, tucked in your pocket or briefcase. Almost as easy to use as pencil and paper, the Newton MessagePad lets you leave your notes handwritten or reads your handwriting and transforms it into typed text. If you prefer, you can type words using an on-screen keyboard. It even cleans up your rough sketches. And as time goes by, it learns about you, your handwriting, and the way you work. Because the Newton MessagePad is designed to know how you work, it can help you work smarter. For example, the Newton MessagePad can find a phone number and dial the phone for you, fax a note, format a letter, and even set up a lunch appointment. The Newton MessagePad comes with built-in applications that include a notepad, to-do list, datebook, and name file to get you started. When you’re ready, you can customize your Newton MessagePad to include Apple and third-party software and hardware additions as well. There’s already a good selection of Shareware available on popular Macintosh FTP Sites like sumex-aim.stanford.edu. 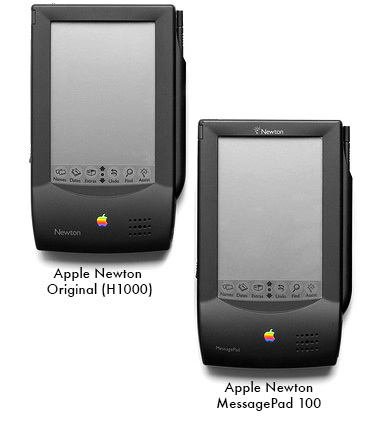 Note: The Original MessagePad (H1000) and Newton MessagePad 100 are identical, only NewtonOS differ and also the logo Newton MessagePad. 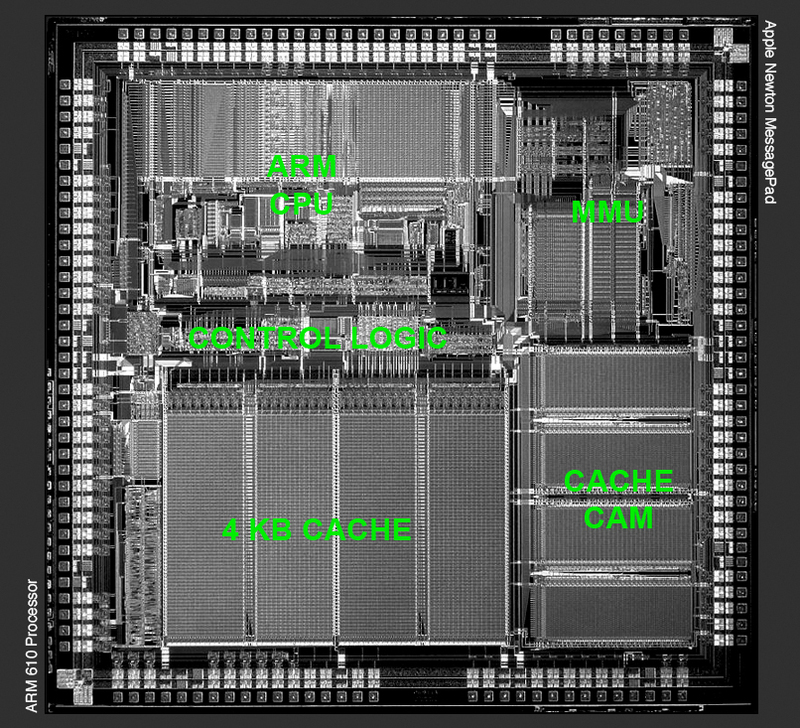 1) ARM610 (Datasheet PDF 131 pages) : RISC ARM 610 CPU at 20 MHz. It was one of the first mobile processors. This chip handles most of the bus activity on the Newton. 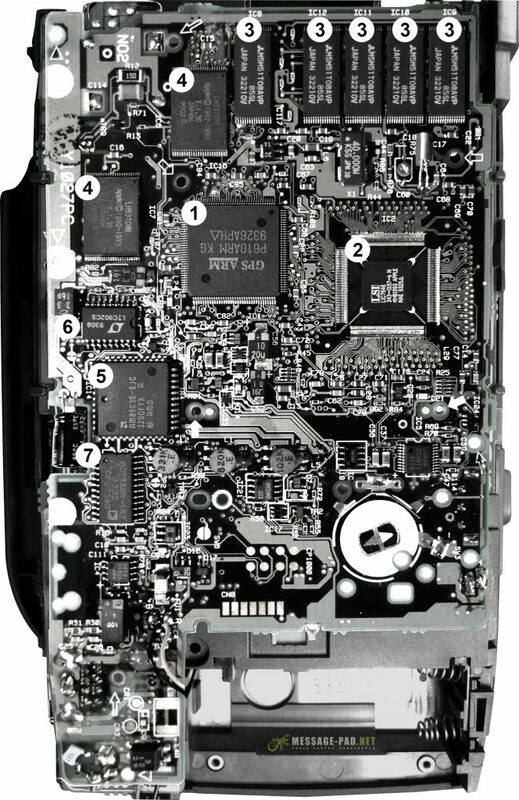 It provides the interface for RAM, DMA, Real time clock, PCMCIA cards, audio, and video. 3) 5x M5M51008AVP-85LL (Datasheet PDF 7 pages): Mitsubishi Electric SRAM, 128k/85ns – This is the main RAM for the Newton. The H1000 comes with 640K. 4) LH537CHT/LH537CHU: Apple Newton ROM. Two identical chips. It comes with 4MB onboard ROM storing the Newton OS. The second chip used for parity checking on the others. 5) AMD AM85C30-8JC (Datasheet PDF 68 pages) or Zilog Z85C3008VSC (Datasheet PDF 102 pages) CMOS serial controller RS422. It’s the chip that controls the serial port on the Newton. 6) LT902SC: This chip is a driver/receiver for the RS422 chip. 7) AD7880AR (Datasheet PDF 17 pages) : Analog to Digital converter chip. 4KB unified cache, 26/32 bit addressing, MMU.. Recognizes handwriting: printed, cursive, or mixed word recognition. Recognizes graphics and the inherent symmetry in objects. Object-oriented data storage optimized for storing, finding, and linking small pieces of information. Easy creation of custom forms applications via the flexible graphical view toolbox. Easy data sharing using standard tags. Object-oriented database provides flexible view of data. Newton Communications Architecture — Provides single interface for all communication services. Integrated to support easy communications with minimum setup requirements. Designed in modules to support new communications capabilities. Assists users in completing repetitive tasks done in multiple categories, including communications, scheduling, finding, and reminding functions. Contains smart defaults to reduce complexity. Allows extensions by third-party developers. Print to Apple LaserWriters and StyleWriters with serial cable and to popular parallel printers using Newton Print Pack. Fax with optional fax modem (9600 baud fax send, automatic cover-page generation, post-formatting). “Beam” via infrared technology (send notes, name cards, appointments at 9600 baud with 1-meter range). Handle telephony needs with assistance for intelligent auto dialing (DTMF or modem dialing). Receive and store wireless messages using optional Messaging Card. Send and receive NewtonMail to other Newtons, PC’s and Macintosh computers with optional modem*. Temperature: +0 to +40 C.
Storage temperature: -20 to +60 C.
Humidity range: 20% to 95% RH noncondensing. Universal, 100 to 240 VAC, 50/60 Hz. Four plug configurations: U.S., U.K., Europe, and Australia. 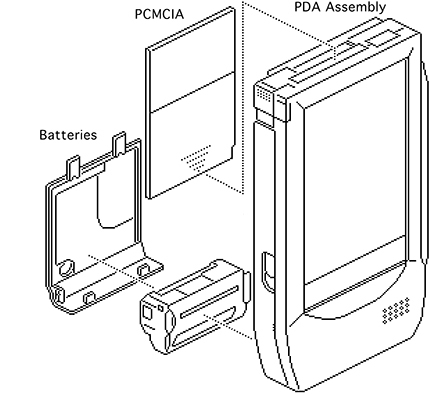 Battery type: alkaline or nickel-cadmium. Alkaline output: 6.0V DC, 1.1 WH (nominal). Nickel-cadmium output: 4.8V DC, 200 mAh (nominal). Operating range: 3 V (nominal). AC adapter (included) or four AAA batteries (included). Works with personal computers running Microsoft Windows; requires connector cable and version 3.0 or later. Works with Macintosh personal computers; requires connector cable and system 7.01 or later. Built-in printer support for the Apple StyleWriter and StyleWriter II. All Apple PostScript laser printers from the LaserWriter Plus and up. The Apple Personal LaserWriter printer. Works with most popular PC printers, including the Hewlett-Packard LaserJet, Hewlett-Packard DeskJet, Canon BubbleJet, and Epson LQ and FX using the Print Pack option.